Cramer & Anderson Attorney Lisa Rivas has won a 2016 New Leaders in the Law award from The Connecticut Law Tribune. Attorney Rivas, an Associate in the firm’s Danbury office who focuses on Immigration Law, is among just 37 winners of the award statewide. The results were announced online Sept. 21. “Applicants were judged in four categories, including development of the law, advocacy/community contributions, service to the bar, and peer/public recognition,” The Connecticut Law Tribune explained. But that’s not what sets her apart. It’s Attorney Rivas’ passionate volunteer work, which she takes on untiringly at a time when many young attorneys would be more focused on jockeying for a partnership. 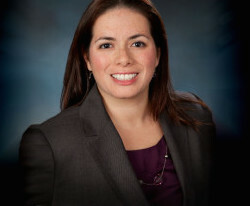 Attorney Rivas also gives free talks on immigration issues that extend to benefits, drivers’ licenses and more—always remaining available to address the questions of guests, for whom “tiny details can make or break a case,” as Attorney Rivas told the Connecticut Law Tribune. To honor that volunteer work, the Hispanic Center [of Greater Danbury] gave Attorney Rivas the Above and Beyond Award at a Citizens Recognition Breakfast in June. Attorney Rivas’ volunteerism, specifically tailored to helping the Latino community in Greater Danbury, doesn’t stop there. She is also a member of the executive board of the Latino Scholarship Fund, which in June awarded 10 scholarships totaling $28,000 to graduating high school seniors.